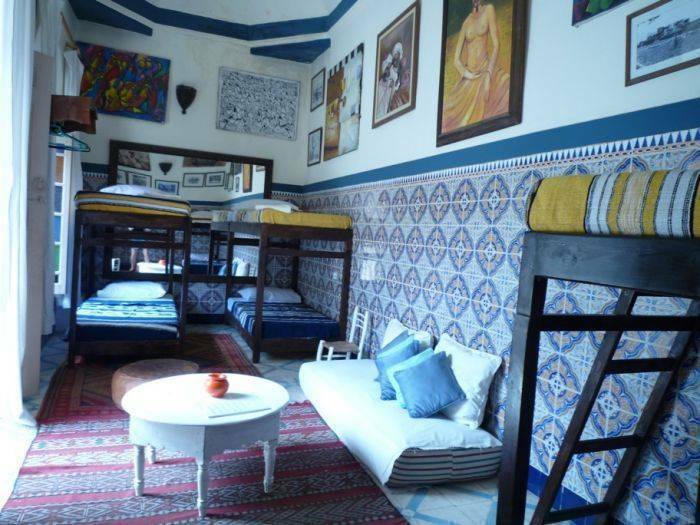 Our hostel is located in a very old riad, just steps from the famous Jamal el Fna (World Heritage UNSCO) close to the souks, museums, restaurants cheap. In a street very typical of Medina. Half board every night € 9 per person, excluding drinks, tagine, couscous Tangier, BERBER BURGER, it's all in our cisinière Jamissa. Relaxation center with steam room, massage and body treatments of the face, only made with natural products. 25% discount for guests of the house. Drink fresh, mint tea or coffee, which can be enjoyed on the patio or terrace. 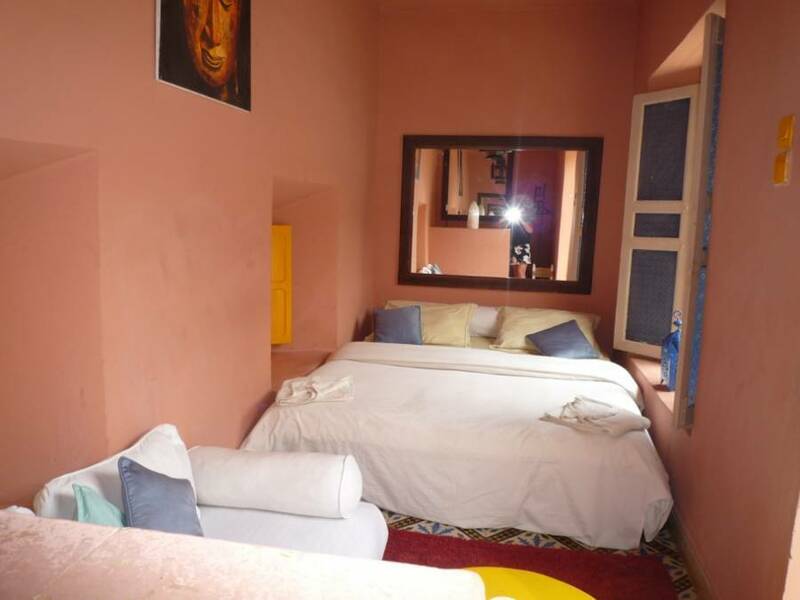 Two very large bedrooms with double bed and a bunk bed that can accommodate from 1 to 4 people, bathroom with shower in the room, and Moroccan sofa, two rooms overlook the patio. A 8 person dormitory with two bathrooms (1 on the 1st floor and one on the patio) Personal locker locking. A dormitory for 4 persons, with a bathroom in the room and storage lockers locking. Cleaning is done every day in doroirs, the linen is gray. Two small rooms one double and one twin with shared bathroom. At the heart of the medina a few steps from the place near jamal el fna souks, shops of souvenirs and local products in our street, bahia museums, tombs Saudi cartier mellha the Koutoubia and nearby. 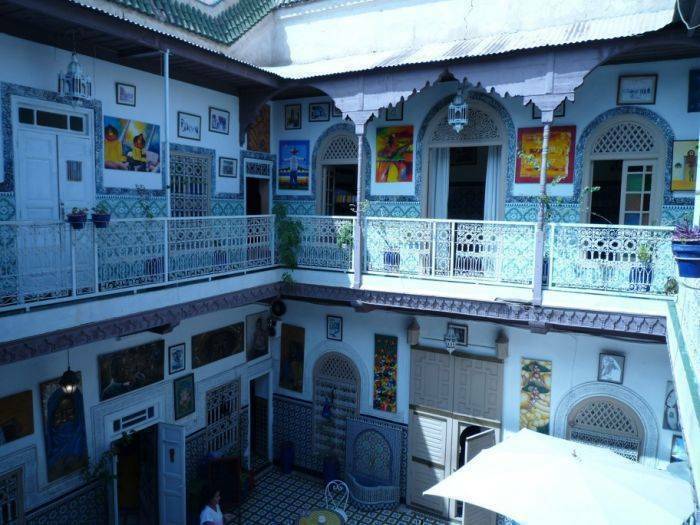 Many small diner or you to taste the specialties of small Marrakech has a very low price. Cancellation until the day before arrival without charge, payment euros, dirhams and bank cards. Caution 15 dhs royal tax per person per day. Arriving from the airport to ask jamal el Fna Square we are two minutes walk, count 10 minutes (barely), the railway or bus station after 10 minutes as well. Whether a station or airport you will find buses that go directly to the place jamal el Fna.